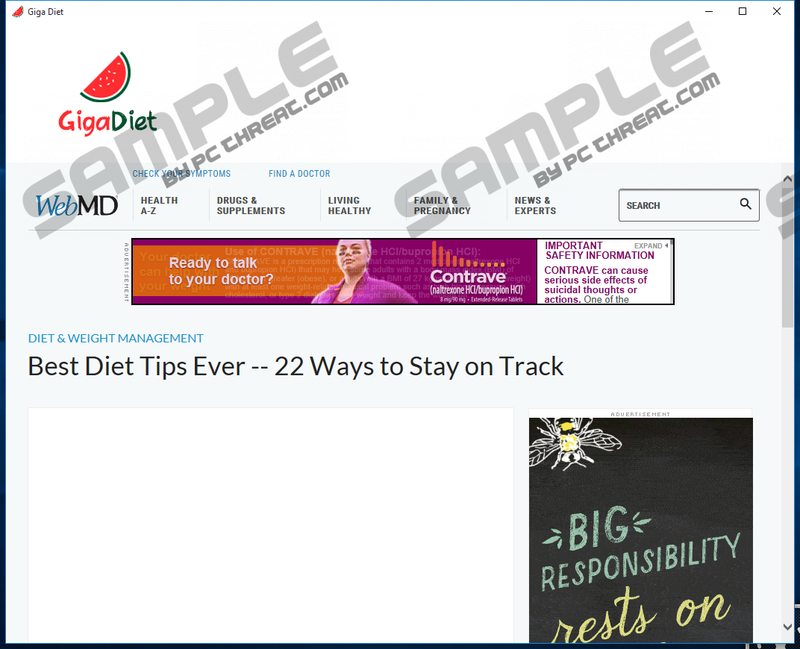 GigaDiet is an undesirable application that might be responsible for the endless stream of commercial ads you see because it is known to be an ad-supported program (adware). Unfortunately, the majority of users download and install this program themselves because they want to receive information associated with weight loss. At first glance, GigaDiet looks like a really beneficial program. It even claims that you will be able to “take control of your diet from your computer” if you install it. Of course, we cannot say that it does not do anything at all; however, it is definitely not as useful as it seems to be at first. Even though it might seem to be a really good program, it is not the best idea to keep it installed because it might even put your system into danger. As this might happen really quickly, we suggest that you hurry to get rid of GigaDiet. It should not be difficult to do that because this program can be erased via Control Panel; however, you should still read this article. As can be seen, GigaDiet applies quite many changes in order to work properly on a user’s PC. Do not worry; you can undo all the changes by uninstalling GigaDiet from your computer. Specialists at pcthreat.com have managed to find out that GigaDiet acts in a similar manner as NewsCert and Moneyzila, which are considered to be potentially unwanted programs. We have found similarities between these programs because all of them can cause redirections to other web pages. In case of GigaDiet, it redirects users to gigadiet.com/redir.php first and then takes them to other pages with the content associated weight loss and diets, e.g. webmd.com/diet/ss/slideshow-best-diet-tips-ever. In addition to this, this application can cause redirections to lamphouseoffers.com/redirect.php?sid=BMS&message=Please%20wai, which presents users with various offers, surveys, and third-party ads. Unfortunately, these ads might be the reason why dangerous threats are installed on your PC. Therefore, it is better to ignore them completely and rush to eliminate adware. Of course, it will not collect such information as name, address, phone number, etc. if you do not provide them yourself; however, you should know that it is possible to tell much about the user from non-personally identifiable information too. If you do not want to reveal any information, you must delete GigaDiet from your computer ASAP. Some users download GigaDiet from its official website gigadiet.com; however, it is known that this ad-supported program is also distributed in InstallCore bundles. Of course, GigaDiet does not travel alone, which means that other undesirable programs might have been installed on your computer too. It has been observed that GigaDiet usually travels together with Sweet-page.com, MyPCBackUp, Yoursearching.com, and System Healer. If you detect those programs on board, it would be best that you erase them because they cannot be called reliable. In order to find out whether or not they are installed quicker, scan your system with a diagnostic scanner. Luckily, GigaDiet can be erased from the system via Control Panel and it does not leave any leftovers. We are sure that you will not miss this program because there is a bunch of other applications that are really useful for those trying to lose some weight. If the manual method is too difficult for you, you can, of course, eliminate this ad-supported program automatically. All you need to do that is to scan the system with an automatic malware remover, such as SpyHunter. The best thing about automatic tools is that they also protect systems from malicious programs that might try to enter the system in the future. Right-click on the lower-left corner and click Control Panel. Find the unwanted program on the list and click on it. Enter Control Panel in the search box on the Taskbar and tap Enter. Find the unwanted program and then Uninstall it. Quick & tested solution for GigaDiet removal.